IntroductionIn this study, we sought to determine whether myocardial contractile reserve (CR) assessed by dobutamine stress echocardiography (DSE) can identify patients who experience nearly complete normalization of left ventricular (LV) function after the implantation of a cardiac resynchronization therapy (CRT) pacemaker.Material and methodsThe study group consisted of 55 consecutive patients with non-ischemic dilated cardiomyopathy, LV ejection fraction (LVEF) < 35%, and prolonged QRS complex duration, who were scheduled for CRT pacemaker implantation. The DSE (20 µg/kg/min) was performed in all patients. The CR assessment was based on a change in the wall motion score index (ΔWMSI) and ΔLVEF during DSE. 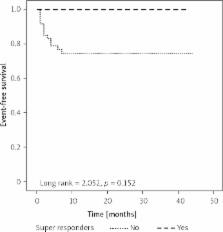 Super-response was defined as an increase in LVEF to > 50% and reduction in left ventricular end-systolic dimension to < 40 mm 12 months following the CRT implantation.ResultsA total of 7 patients (12.7%) were identified as super-responders to CRT. When compared to non-super-responders, these patients had significantly higher values of the dobutamine-induced change in ΔWMSI (1.031 ±0.120 vs. 0.49 ±0.371, p < 0.01), and ΔEF (17.9 ±2.2 vs. 8.8 ±6.2, p < 0.01). Receiver operating characteristic analysis showed that dobutamine-induced changes in ΔWMSI ≥ 0.7 and ≥ 14% for ΔEF are the best discriminators for a super-response. Patients with ΔWMSI ≥ 0.7 and ΔEF ≥ 14% are significantly less often hospitalized (p < 0.01) for worsening of heart failure during 28.5 ±3.0 months of the follow-up.ConclusionsContractile reserve assessed by DSE can identify patients with dilated cardiomyopathy who are likely to experience near normalization of LV function following CRT. Recommendations for quantitation of the left ventricle by two-dimensional echocardiography. American Society of Echocardiography Committee on Standards, Subcommittee on Quantitation of Two-Dimensional Echocardiograms. We have presented recommendations for the optimum acquisition of quantitative two-dimensional data in the current echocardiographic environment. It is likely that advances in imaging may enhance or supplement these approaches. For example, three-dimensional reconstruction methods may greatly augment the accuracy of volume determination if they become more efficient. The development of three-dimensional methods will depend in turn on vastly improved transthoracic resolution similar to that now obtainable by transesophageal echocardiography. Better resolution will also make the use of more direct methods of measuring myocardial mass practical. For example, if the epicardium were well resolved in the long-axis apical views, the myocardial shell volume could be measured directly by the biplane method of discs rather than extrapolating myocardial thickness from a single short-axis view. At present, it is our opinion that current technology justifies the clinical use of the quantitative two-dimensional methods described in this article. When technically feasible, and if resources permit, we recommend the routine reporting of left ventricular ejection fraction, diastolic volume, mass, and wall motion score. Resting myocardial blood flow, coronary flow reserve, and contractile reserve in hibernating myocardium: implications for using resting myocardial contrast echocardiography vs. dobutamine echocardiography for the detection of hibernating myocardium.